AutoTrac™ Turn Automation automatically guides the tractor through the optimum pass and carries out end-of-row functions at appropriate times during the sequence. This functionality reduces input costs and reduces strain on the operator. When operators spend their workday manually steering a tractor and implement around an end-of-row turn while also watching for obstacles and executing end-of-row functions such as raising the implement and down shifting the tractor, they tend to get tired. This causes headland inconsistencies. All of these benefits result in more uptime for the equipment and an operator who is more alert at the end of the day. AutoTrac™ Turn Automation is compatible with the Gen 4 4600 CommandCenter™ processor v2.0 and the 4640 Universal Display. 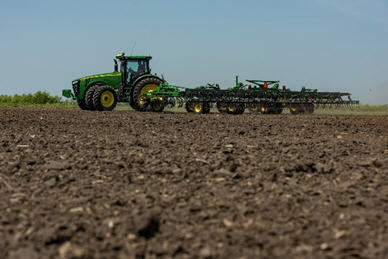 AutoTrac Turn Automation is the next step toward complete tractor automation. This advanced solution coordinates machine and implement functions with end turns by utilizing the Gen 4 Display, as well as the StarFire™ 6000 Receiver or StarFire 3000 Receiver. AutoTrac Turn Automation enables operators to automate many in-cab tasks using the location of the machine, the location of the boundaries, and a sequence of functions. Machine and implement functions perform consistently on headlands or internal boundaries with this level of automation. 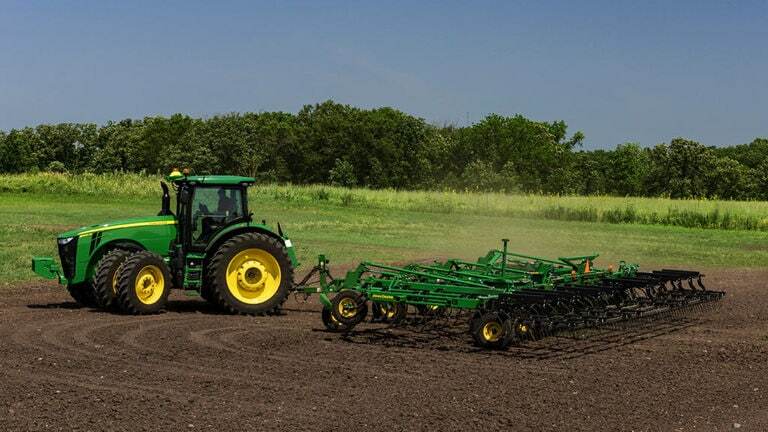 This system accurately guides the tractor around an optimal end-of-row turn that is generated using implement and machine dimensions input into the display. AutoTrac Turn Automation uses iTEC™ machine control capabilities to execute sequences on end turns. By automating these tasks, this system also more accurately positions the machine and implement for the next field pass to increase accuracy and efficiency. 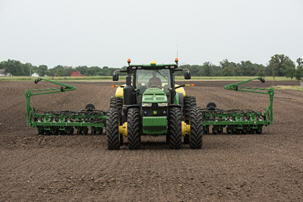 Operating at optimal speeds with correct implement functions occurring is all made easy with AutoTrac Turn Automation. 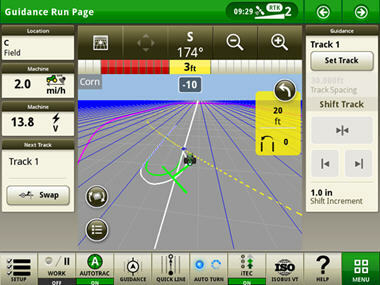 AutoTrac Turn Automation helps growers reach a higher level of precision and efficiency. It also reduces operator fatigue and increases efficiency. Once operators have experienced it, they will not want to maneuver turns without it. There is no better way to start the experience than with an AutoTrac Turn Automation demonstration. AutoTrac Turn Automation automates tractor and implement functions during end-of-row turns or internal boundaries. Set up is simple and can be accomplished from one easy-to-use set-up page located within the AutoTrac Turn Automation app on a Gen 4 4600 CommandCenter™ processor version 2.0 or 4640 Universal Display. AutoTrac Turn Automation works with straight track guidance. AutoTrac Turn Automation is not compatible for applications in emerged row crops. AutoTrac Turn Automation is not compatible with EasyFold technology on SeedStar 4 planters or TruSet™ tillage technology. 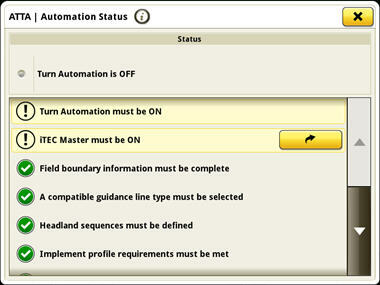 Boundaries must be set up accurately to allow AutoTrac Turn Automation to function as expected. Required for AutoTrac Turn Automation to operate and is the perimeter of the field. For best accuracy, these should be driven recorded boundaries. Required for AutoTrac Turn Automation to operate and is the end rows along the sides of the field where the end turns occur. Optional for AutoTrac Turn Automation to operate and is the perimeter of an area inside the field that is not farmed but can be crossed with a machine and implement. An example would be a waterway. Optional for AutoTrac Turn Automation to operate and is the perimeter of an area inside the field that is not farmed and cannot be crossed with a machine and implement. Optional for AutoTrac Turn Automation to operate and is the end rows or turn rows around an impassible interior boundary. Headland boundaries can be created by constant offset headland boundaries. Only exterior boundaries and impassible interior boundaries can have a headland boundary. Headland boundaries are displayed as dashed yellow lines. AutoTrac Turn Automation sequences, functions, and automated turns are generated using the headland’s distance from exterior or impassable interior boundaries. Headland boundaries can be entered as an offset from the exterior or interior boundary.